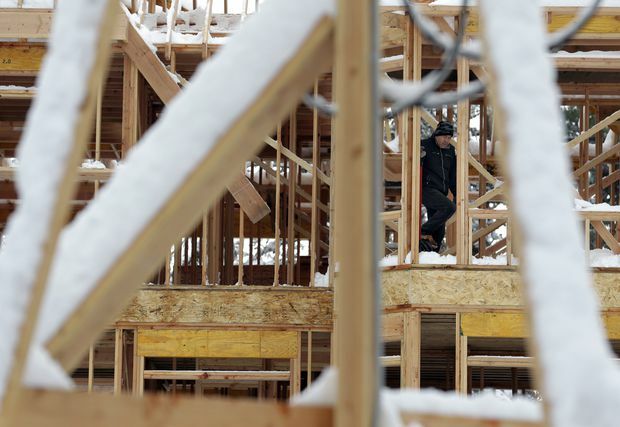 In this March 4, 2019, file photo, a construction worker pauses while shoveling snow off the frame of a partially built house in Tenafly, N.J.
U.S. home building fell more than expected in February as construction of single-family homes dropped to more than a 1-1/2-year low, but the outlook for the housing market is improving amid declining mortgage rates. Housing starts decreased 8.7 per cent to a seasonally adjusted annual rate of 1.162 million units last month, the Commerce Department said on Tuesday. The per cent decline was the largest in eight months, and bad weather could have contributed to the sharp drop in home building last month. Housing starts data for January and December were revised higher. Building permits fell 1.6 per cent to a rate of 1.296 million units in February. While that was the second straight monthly drop in permits, they are now outpacing starts, which suggests a pickup in home building in the months ahead. The housing market hit a soft patch last year, squeezed by higher mortgage rates, pricey lumber, and land and labour shortages, which led to tight inventories and more expensive homes. But borrowing costs have eased as the Federal Reserve signalled it was halting further interest rates increases this year amid growing headwinds to the economy. The 30-year fixed mortgage rate dropped to an average of 4.28 per cent last week, the lowest in more than a year, from 4.31 in the prior week, according to data from mortgage finance agency Freddie Mac. House price inflation is also slowing. Still, home builders remain constrained in their ability to construct more homes for the lower end of the market. A survey last week showed confidence among home builders was steady in March, with builders still complaining about the scarcity of skilled workers and land, as well as zoning restrictions in many major metro areas. Investment in home building contracted 0.2 per cent in 2018, the weakest performance since 2010. The dollar was little changed against a basket of currencies after the housing starts data, while U.S. Treasury yields fell slightly. Single-family home building, which accounts for the largest share of the housing market, tumbled 17.0 per cent to a rate of 805,000 units in February, the lowest level since May 2017. The percentage drop in single-family home building was the largest since February 2015. Single-family home building fell in all four regions last month. Permits to build single-family homes were unchanged in February at a pace of 821,000. These permits are now leading housing starts, suggesting a rebound in single-family construction in the coming months. Starts for the volatile multi-family housing segment jumped 17.8 per cent to a rate of 357,000 units in February. Permits for the construction of multi-family homes fell 4.2 per cent to a pace of 475,000 units last month. Housing completions increased 4.5 per cent to 1.303 million units in February, the most since January 2008. Multi-family home completions surged 40.4 per cent to 473,000 units, the highest since April 1988. Single-family home completions fell 10.0 per cent to 816,000 units, indicating the inventory shortage could persist for a while. There was also a decrease in the number of homes under construction last month.